Scosche has announced MagicGrip Charge, a unique new Qi-enabled wireless charging mount that uses side grips to secure an iPhone in place, with motorized arms that automatically close when a Qi-enabled device is aligned over its charging coil. The sensing closure ensures perfect placement of the iPhone for optimum charging while securely holding the device in place and still providing full visibility. The charging head allows for full 360-degree rotation, so the iPhone can be viewed in landscape or portrait orientation, or any angle in between, and since the mount charges wirelessly, there are no cables in the way. Like Scosche’s MagicMount Charge 3, announced earlier this week, MagicGrip is also designed to provide thermal management, with the arms keeping a gap between the charging head and the iPhone, allowing heated air to disperse, thereby providing cooler charging which will prolong the device’s battery life. MagicGrip is Qi-certified and delivers up to 10 watts of charging power, meaning maximum wireless charging speeds are supported for all of Apple’s current iPhone models as well as Samsung Fast Charge device, and of course MagicGrip includes the usual safety features such as Foreign Object Detection. 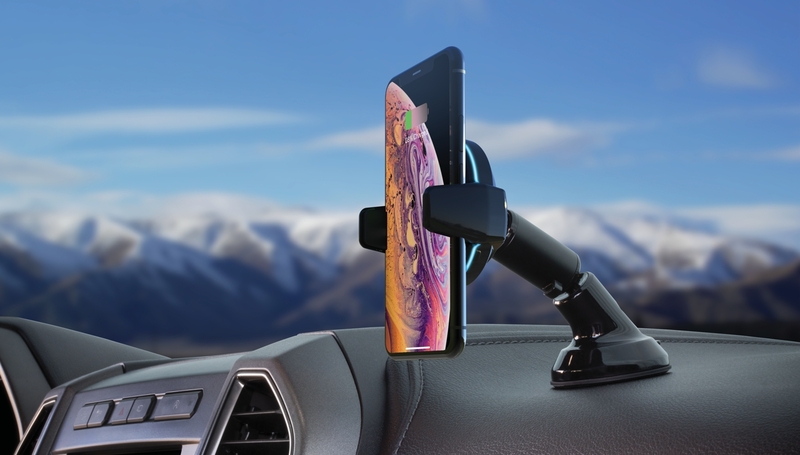 MagicGrip is available in the same four mounting options as MagicMount Charge 3, providing for dash mounting, windshield mounting, or vent mounting. MagicGrip Charge is expected to be available this fall.